We all have deadlines, some of us thrive on them, but others find them stressful. 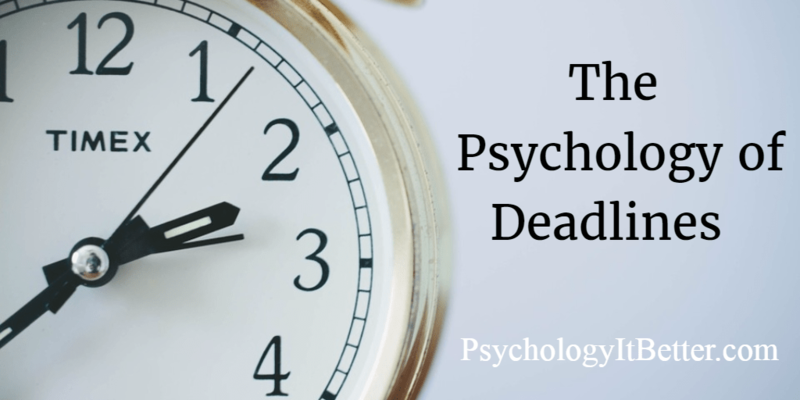 Anyone working with others and / or with complex interdependent task needs deadlines, but psychologists have found that they can have negative effects. As deadlines approach, we can get stressed (and think we are under more pressure than others!) 1. When deadlines are very close, we can exchange accuracy for speed2, which can lead to poor judgements. Some evidence also suggests we rely more on intuition when deadlines close3. But, deadlines also improve negotiation outcomes4, and are help teams organise (see 5). They are also said to ‘Translate Dreams into Goals’ (which I guess is a good thing if you have nice dreams!). So, research (and anecdote) puts forward a mixed picture. One way to explain why sometimes deadlines help and sometimes they do not is through ideas of intrinsic and extrinsic motivation. Intrinsic motivation come from inside yourself- you do things because they bring you satisfaction in and of themselves. Extrinsic motivation is driven by external factors (i.e. monetary reward or the threat of penalties. Both intrinsic and extrinsic motivators can get you going. However, the former tends to be more long lasting, durable and, in general, a better predictor of ‘getting things done’ – especially when no-one is watching! For my end-of-grant report, I really want to know what the results of my study are – it’s the neat bit of psychology! So, these deadlines are welcome, as they push things up a busy to-do list. They help structure my week/month/day’s work. In contrast, other work (processing some internal admin applications) feel more of a chore (I have to do them, as part of my job, for which I am paid). Needless to say, the grant report is going well, whilst the admin is staring up at me now. (Blog writing has a deadline, but I am pretty intrinsically motivated!) What does this have to with deadlines? If you are externally motivated, deadlines can mean bringing forward things you don’t want to do. This can be unpleasant, and increase procrastination. Interestingly, externally imposed deadlines have been shown to decrease intrinsic motivation6. In contrast, internally imposed deadlines reduce procrastination7. So, it may be much better to set your own deadlines, rather then have them set for you.